The Asian elephant can weigh up to 5400 kg (11,900 lb). It currently occupies forested habitats in hilly or mountainous terrain, up to about 3600 m (11,800'). An adult eats approximately 150 kg (330 lb) per day - mainly grasses but also leaves, twigs and bark. It feeds during the morning, evening and night and rests during the middle of the day, requiring shade during the hot season to keep from overheating. Elephants cannot go for long without water (they require 70-90 liters (19-24 gal) of fluid/day) and sometimes must travel long distances each day between their water supplies and feeding areas. One calf is born every 3-4 years after a pregnancy lasting about 22 months. Although mature male elephants may live alone, females live in family groups consisting of mothers, daughters and sisters, together with immature males. Wild elephants can live to be sixty years old. The Asian elephant once ranged from the Tigris and Euphrates Rivers in ancient Mesopotamia in the west, east through Asia south of the Himalaya to Indochina and the Malay Peninsula, including Sri Lanka and Sumatra and possibly Java, and north into China at least as far as the Yangtze River. In the 19th century it was still common over much of the Indian subcontinent, Sri Lanka and the eastern parts of its range. By 1978, Asian elephants were found in the same countries as they are at present. Female Asian elephants are not affected by ivory poaching (due to their lack of tusks), so poaching has not affected the overall population numbers of Asian elephants as drastically as it has in the case of the African elephant. The single most important cause of the decline of the Asian elephant has been the loss of habitat. They have also been affected by persecution due to the crop damage they are perceived to cause. *** The Asian elephant has been domesticated for centuries; it is intelligent and docile when well treated. *** In 1879, India passed the Elephants' Preservation Act. This act decreed that no wild elephant shall be killed or captured unless in a person's self-defense, or because of damage being caused. The basis for this law was the importance of the service elephants provided to mankind. *** The Asian elephant is distinguished from the African elephant in that the Asian elephant has considerably smaller ears, the forehead is flat and the top of the head is the highest point of the animal. In the African elephant, the ears are large, the forehead is more convex, and the back more sloping, so the shoulders are the highest point. Both sexes of the African elephant have tusks, while female Asian elephants do not have tusks. The species once ranged from the Tigris and Euphrates Rivers in ancient Mesopotamia (45 deg East) in the west, east through Asia south of the Himalaya to Indochina and the Malay Peninsula, including Sri Lanka and Sumatra and possibly Java, and north into China at least as far as the Yangtze River (30 deg North). In the 19th century it was still common over much of the Indian subcontinent, Sri Lanka and the eastern parts of its range. By 1978, Asian elephants were found in the same countries as they are at present. Female Asian elephants are not affected by ivory poaching (due to their lack of tusks), so poaching has not affected the overall population numbers of Asian elephants as drastically as it has in the case of the African elephant. However, the poaching of males in some Asian elephant populations has resulted in a highly skewed male:female ratio which can have serious demographic and genetic consequences. (Sukumar et al. 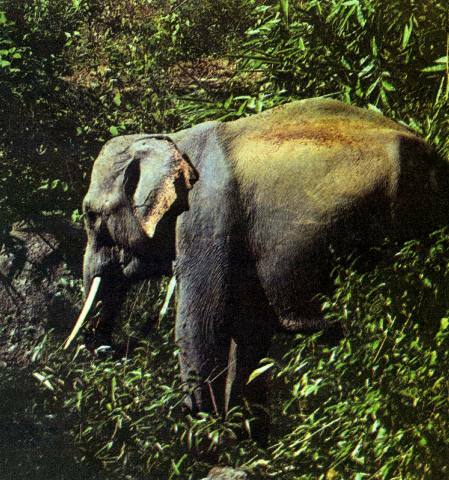 1998) The single most important cause of the decline of the Asian elephant has been the loss of habitat. (Sukumar 1990) Through the 1970's, elephant populations continued to undergo habitat encroachment and fragmentation, and in the planning stages of development programs little consideration was given to elephants or other wildlife. (Olivier 1978) In summary, reasons for decline include persecution of wild elephants due to the crop damage they are perceived to cause, hunting (mainly for ivory but also for meat) and habitat loss due to expanding human population and the loss of forests in Asia. Females average 2720 kg (5980 lb). Large bulls weigh 5400 kg (11,900 lb) (Nowak 1999) . The Asian elephant currently occupies forested habitats in hilly or mountainous terrain, up to about 3600 m (11,800'). It is adaptable and can occur in a wide range of habitats, from thick jungles to grassy plains. Female Asian elephants attain sexual maturity when 9-12 years old. Males are capable of reproduction at 10-17 years, but they are still too young to dominate older females and do not significantly contribute to reproduction. Sexual maturity may be delayed for several years during drought or periods of high population density. One calf is born at a time. A female may produce a calf every 3 - 4 years, although this period may be extended when conditions are unfavorable for survival, such as during drought. Fecundity: Age 0 - 15: 0.0 (births/female/year); age 16 - 50: 0.225 (births/female/year); age 51 - 60: 0.20 (births/female/year) (Sukumar et al. 1998). There is a long period of juvenile dependency. The infant suckles for 3 - 4 years. Young males appear to leave the family group and become solitary at about the time they become sexually mature. The period of greatest female fecundity is between 25-45 years. Sixty years in the wild (more than 80 years in captivity). The Asian elephant eats grasses and small amounts of leaves, woody parts of trees and shrubs - twigs, branches and bark. Cultivated crops, such as bananas, paddy and sugar cane are also preferred, with the result that the elephant often becomes a pest in agricultural regions. It will also eat large quantities of flowers and fruits when these are available and will dig for roots, including bamboo. The Asian elephant is gregarious, and, although males sometimes live alone, females are always found in family groups consisting of mothers, daughters, sisters and immature males. In the 19th century, these family groups usually consisted of 30 - 50 animals, but much larger groups, as large as 100 individuals, were not uncommon. Sometimes an adult male can be associated with a herd. When not, adult males usually remain solitary and disperse over relatively small, widely overlapping home ranges; sometimes they gather together in small but temporary bull herds. They do not seem to be territorial, and there is a great amount of toleration between them, except possibly when the cows are in estrus.